Don’t Allow Birds to spoil your business! A bird control and prevention program is essential to the success of your business. Since each and every facility is different, Professional Pest Management will create a plan tailored to your facility. We will use a combination of exclusion, good sanitation, and good prevention methods to ensure the safety of your facility. Spikes are a popular choice for most facilities trying to exclude pigeons and birds from sitting on signs, the edges of buildings, flat surfaces, and any place where they may be able to perch and defecate below. Bird spikes come in 3 different widths so any ledge can be protected. Bird Netting offers a physical exclusion from pigeons, sparrows, and starlings that may be roosting on your facility or passing through on a daily basis. 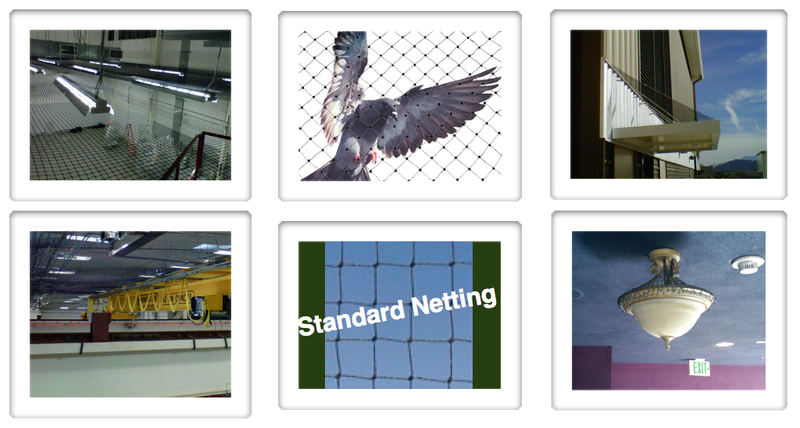 Bird Netting if possible is the best method of control for large areas such as roof tops, ceilings, alcoves, etc. where birds nest, perch, and reproduce. We believe that there is a humane way to remove pigeons from your facility. We have built pigeon control coops that allow us to trap and then relocate the pigeons without having to euthanize them. Each coop is equipped with water and food. A drop cloth is placed under each coop to keep the roof area clean of pigeon droppings. Quality Catch and Release offers a solution where ledge spikes, avitrol, netting, and other bird control products do not work. Quality Catch and Release coops are checked every other week to ensure that the birds are handled in a humane way. Once brought back to our offices and Aviary Group will collect the birds from us. Hot foot is designed to deter birds from landing on ledges, piping, and areas where spikes and other bird repellant products may not work quite as well. As birds land they will get their feet or feathers temporarily stuck and will then deter them from coming back to perch in the same area. The Bird Shock Flex Track is a low-profile ledge deterrent system that is effective against all species of pest birds utilizing the principle of fear and flight, conditioning birds to stay away. It’s only 1/4-inch high and is available in five colors. 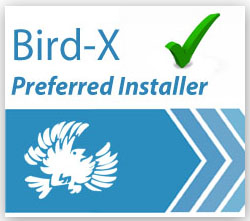 The Bird Shock Flex can be used on ledges, beams, signs, roofs, parapets, etc. One of the best features of the Bird Shock Flex is that it can be installed on all contoured ledges and can bend and turn to fit the design of the building or facility. Avitrol is a good method of control in areas such as roof tops, ledges, and warehouses and can be a very cost effective control measure. Bird wire is a spring tensioned system designed to create an unstable landing area for pigeons and larger birds. Bird wire is good in places where there are different levels or where bird spike or netting cannot be used. Are birds overtaking your solar panels? Don’t know what to do? We have a solution for you. First we need to take care of all nesting areas under the solar panels, then we can work to get rid of the birds that have taken occupancy at your home. 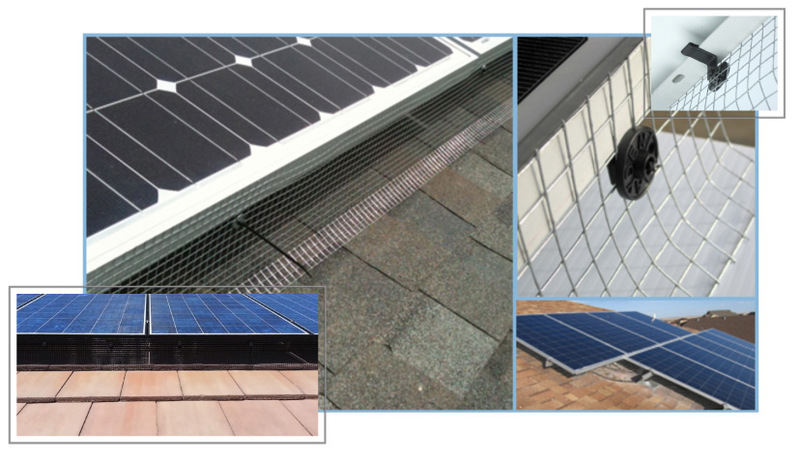 First, We have a product that allows us to eliminate all nesting areas under your solar panels without drilling holes in your solar panels or your roof. Next we have several options depending on where you live and how big the bird population is to get rid of all pigeons at your home. We have the Catch and Release program, Avitrol Baiting Program, and Other exclusion methods. Give us a call for a FREE, NO OBLIGATION consultation of your home or facility. Daddi Long Leg’s unique design deters gulls, pigeons, and other large birds from rooftops, A.C. units, street lights, and other open areas.